Mar Hall Golf and Spa Resort is a hidden gem. A magnificent five star hotel close to Glasgow Airport and within easy reach of both Glasgow and Loch Lomond, it stands just to the south west of the Erskine Bridge in a location that offers views over its own championship golf course and the River Clyde to the Kilpatrick Hills beyond. With five stars, you take the excellence of the accommodation as read. But add into the package some of the best service you will find anywhere, from a team who are obviously very proud to work here, plus simply outstanding food, and the end result is a hotel that deserves to be much better known than it is. You can read our dining review for Mar Hall here. Mar Hall was built between 1828 and 1845 for Major General Robert Walter Stuart, the 11th Lord Blantyre, by the architect Sir Robert Smirke. Until the 1700s the estate had been a property of the Erskine family, the Earls of Mar, and is said to have been visited by both Mary Queen of Scots and Robert the Bruce. During the First World War, Mar Hall became a military hospital, and it later fell into disrepair. 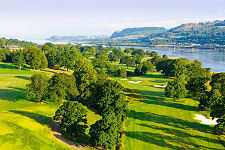 A £15m restoration preceded its opening as a hotel in 2004, and the 18 hole Earl of Mar golf course was added in 2010. You catch a brief glimpse of Mar Hall from the drive, but your first real view is of its east front and imposing entranceway. This leads up to the reception area, beyond which is Mar Hall's main architectural glory, the Grand Hall. The Grand Hall runs most of the length of the building and offers comfortable seating for guests enjoying morning coffee, afternoon tea, or simply a quiet moment to themselves. It also offers a truly spectacular ceiling, which illustrates beautifully the architect's aim to produce a building modelled on a Gothic Elizabethan mansion. At the far end of the Grand Hall are the Spike Bar and the Cristal Restaurant, which also offer the remarkable ceilings (and wonderful fireplaces) that characterise Mar Hall. There are 53 individually designed rooms and suites on offer at Mar Hall. Each of course offers all the fittings and facilities you would expect of a five star hotel. They are graded as Classic and Deluxe Rooms, and Junior and Grand Suites. As you move up the scale, provision of features like four poster beds and fireplaces increases. The rooms are found in many different parts of the hotel. There are a few on the second floor of the main building, with some on the first floor and ground floor, while others are located in the eastern wing which also houses the grand entrance, and in the more modern spa and health wing at the west end of Mar Hall. As you would expect from somewhere that calls itself "Mar Hall Golf and Spa Resort", the leisure side of what is on offer is important. We've already mentioned the 18 hole championship golf. The Leisure Club offers a well equipped gymnasium, a fitness studio, a 20m swimming pool, steam rooms and saunas, plus fitness instructors and a swimming coach. Meanwhile the Decelor Spa offers a wide range of treatments from facials to body treatments, plus wedding packages. Mar Hall describes itself as "one of Scotland's most sought after luxury wedding venues", and we can see why that might be. A number of different packages are on offer, and a wide range of different sized weddings, from 40 to 300 guests, can be accommodated. The hotel is licensed to hold Civil Ceremonies. The hotel's location also makes it ideal as a venue for business meetings or conferences, or team building events. There are seven meeting rooms in all, with the largest capable of accommodating between 400 and 800, depending on layout. Being a fairly recently refurbished hotel, disabled access is good. There is level wheelchair access from the car park via the lower ground floor to the lift, which links to the ground and first floors of the main building. Public rooms on the ground floor are all level access with good sized doorways, and there is a disabled toilet serving the public areas. One guest room has been adapted for use by disabled guests. Some hotels are instantly forgettable, while others linger in the memory. 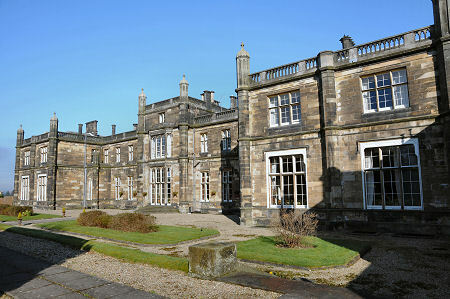 Mar Hall Golf and Spa Resort does what it does very well indeed, in a magnificent building in beautiful surroundings. Add the quality of the service and the food, and you have a hotel that will definitely stay in the memory, and for all the right reasons. You can read our dining review for Mar Hall here. Mar Hall Drive, Bishopton, PA7 5NW.